Much has already been written already about the potential of using Ebola as a terrorist weapon, just Google it. Both the US and Soviet Union considered it for use as a bio-weapon. The Japanese Cult Aum Shinrikyo tried to obtain Ebola for use as a terrorist weapon before they bombed the Japanese subways with Sarin Gas. The cult sent a team of people to Africa, but they were unable to obtain samples of the virus. Now Ebola is widespread in Africa and readily available for terrorist groups to obtain, especially for jihadists, who do not fear dying in the attempt. Many have concluded that it would be difficult for terrorists to spread Ebola widely in the US and that a country with a strong medical system would react quickly and stop the spread of the disease caused by a few terrorists intentionally infecting the public. Our confidence has been shaken a little in the last few weeks in the ability of the US medical system to deal with even a few cases of Ebola. However, the following seems to be is what the analysts are overlooking. It is not necessary for terrorists to infect the US directly. 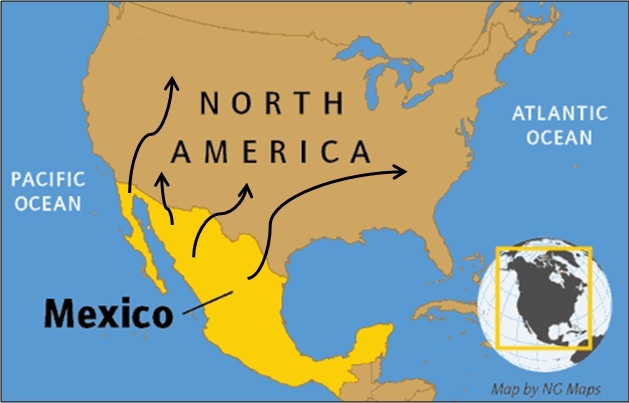 We have a populous neighbor to the south of us, Mexico, which does not have a strong medical system and we have a high-traffic, porous border. There are millions of Mexicans and other Latin Americans crossing the border every year. Terrorists only have to spread Ebola in Mexico, where it would in short order overwhelm the Mexican medical system. When that happens, it will not be a couple of terrorists spreading the virus to a few people in the US. There would eventually be thousands of border crossers carrying the deadly virus across the border infecting many thousands of Americans. This would be a means of mass infection of the US by terrorists. The US medical system cannot deal with such a mass infection without mass production of medical treatments and a vaccine for Ebola. There will be no chance to trace the contacts of the illegal aliens crossing the border and they will spread it far and wide to the most vulnerable parts of the US in impoverished neighborhoods. The Border Patrol even helps deliver 10’s of thousands of illegal aliens to their destinations all across the US by Obama’s (illegal) order. If there is a large uncontrolled outbreak in our neighbor, Mexico, it will be extremely difficult to prevent a similar mass outbreak in the US. All the terrorists have to do is infect a few people in Mexico with Ebola, not necessarily masses of people in the US directly. It may already be spreading in Mexico without our knowing about it. Political correctness will kill us in this case. I fully believe that this circumstance may have been created for one purpose or another, or it is simply being manipulated through doing nothing smart to stop it and I fully believe that at the least it will be used to steal attention away from the 2014 year end elections. I am thinking maybe the Russians started it, but Obama does not seem too concerned about exposing Americans to it.